We watched Ordinary People last night. It’s a film we’d both seen before, though not in decades. 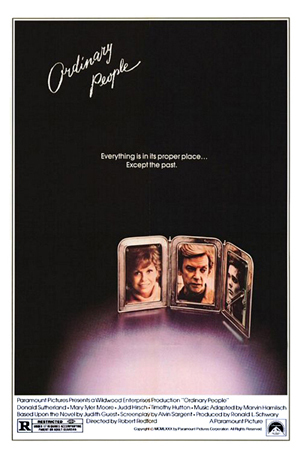 Diane first saw it in a movie theater not long after its Sept. 19, 1980, release and I first saw it on PRISM, a now-defunct regional premium cable channel that was popular in the Philly area at the time, about a year later. An understated and powerful movie, it won a bevy of Academy Awards, including Best Picture, Best Director (Robert Redford, in his directorial debut) and Best Supporting Actor (Hutton). For those unfamiliar with it, the drama delves into the dynamics of a dysfunctional family following the death of eldest son Buck (Scott Doebler), who perished in a sailing accident that youngest son Conrad (Timothy Hutton) survived. As the story opens, Conrad has recently returned from a stay at a psychiatric hospital after a failed suicide attempt; he’s racked with survivor’s guilt. Mother Beth (Mary Tyler Moore, in an Oscar-nominated performance) is emotionally distant, more concerned with appearance than addressing his (or her, for that matter) needs. Father Calvin (Donald Sutherland), on the other hand, just wants everyone to get along. As Roger Ebert put it in his review, he’s “one of those men who wants to do and feel the right things, in his own awkward way.” Enter psychiatrist Tyrone Berger (Judd Hirsch) and the down-to-earth Jeannine (Elizabeth McGovern), a girl who catches Conrad’s eye. Both, in their ways, help him overcome the guilt – one knowingly, the other not. In other entertainment events from that September, the Dionne Warwick-hosted Solid Gold syndicated music series debuted on the 13th. I have no memory of whether I watched it or not; likely not. If I wasn’t out at a movie – at the Hatboro Theater in downtown Hatboro or the Eric Theater in the Village Mall in Horsham – I was likely reading the Sunday newspaper while listening to the oldies on the radio, listening to music in my room and/or watching TV. (How’s that for narrowing it down?) I was 15, a high-school sophomore and serious music fanatic. Among the album releases for the month: Kate Bush’s Never for Ever; David Bowie’s Scary Monsters (and Super Creeps); the Doobie Brothers’ One Step Closer; Ozzy Osbourne’s Blizzard of Ozz; Barbra Streisand’s Guilty; Utopia’s Deface the Music; Stevie Wonder’s Hotter Than July; and Molly Hatchet’s Beatin’ the Odds. 1) Diana Ross – “Upside Down.” For the third week in a row, Diana held the top spot with this infectious song. It, like the 1980 diana album as a whole, was written and produced by Chic’s Nile Rodgers and Bernard Edwards, though the end result was not what they intended. Afraid that the original mix was too disco, which was quickly falling out if favor, Diana and engineer Russ Terrana gave the set a sleek, more pop-oriented makeover. 3) Paul Simon – “Late in the Evening.” Clocking in at No. 7 is this classic from Paul Simon, which is one of my favorite songs by him. 4) Olivia Newton-John & Electric Light Orchestra – “Xanadu.” Just bubbling under the Top 10, at No. 12, is this, the title song to the movie musical, which was released the previous month. I saw the film at the aforementioned Eric Theater and, like most who did, didn’t find it a five-star affair. (An understatement, that.). The soundtrack, however, was darn good; I played it to death. 5) Bob Seger & the Silver Bullet Band – “You’ll Accompany Me.” Here’s a classic song from Michigan’s rock ’n’ roll laureate. Against the Wind, the album that it’s from, was my Album of the Year for 1980; I still think it’s great. 6) Christopher Cross – “Sailing.” Falling from No. 5 to 15 is this Grammy Award-winning song from Christopher Cross. I imagine that this song, from Cross’ debut, would be lumped into what’s now known as “yacht rock.” Whatever. At the time, I found it a pleasant diversion that I didn’t need to own – it was played fairly often on the radio, after all. Nowadays? I often play Rumer’s version from her 2014 B-Sides & Rarities collection. 7) Olivia Newton-John – “Magic.” This classic ONJ number held the top spot for four weeks in August before beginning its downward drift. This week, it fell from No. 13 to 27. 8) Jackson Browne – “That Girl Could Sing.” Debuting on the charts this week, at No. 82, is this classic song from Hold Out, Browne’s only album to reach No. 1.